Background: In spite of substantial progress in scientific cognizance and medical technology, still infectious diseases are among the leading cause of morbidity and mortality. Creatinine and Schiff bases are well known for their diverse range of biological activities and thought to be emerging and useful therapeutic target for the treatment of several diseases. Methods: The present work was aimed to illustrate the influence of substitution of amides and Schiff bases on creatinine and their antimicrobial, antioxidant and anti-urease effectiveness was determined. Creatinine substituted amides (1-2) and creatinine Schiff bases (3-7) were synthesized and characterized by NMR and IR spectral data in combination with elemental analysis. All the compounds (1-7) were investigated on Jack bean urease for their urease inhibitory potential. Investigation of antimicrobial activity of the compounds was made by the agar dilution method. Moreover, 1,1-diphenyl-2- picrylhydrazyl (DPPH) method was used to determine their antioxidant potential. Molecular docking studies were also carried out to elucidate their relationship with the binding pockets of the enzyme. Results: The compounds were found to be potent inhibitors of urease. The synthesized derivatives exhibited significant inhibition against Gram-positive and Gram-negative bacterial strains, as compared to standard, ciprofloxacin. 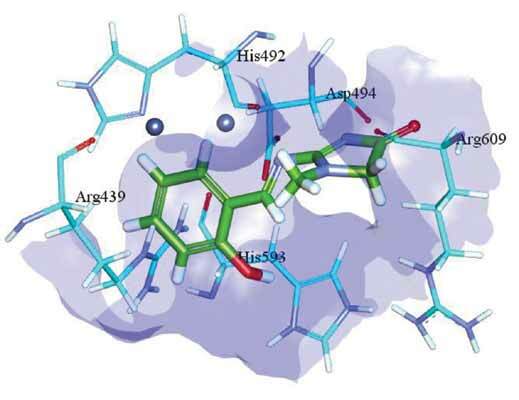 Creatinine based derivatives exhibited potential antifungal activity when tested on infectious and pathogenic fungal strains. Similarly, most of the compounds exhibited good antioxidant activity. Conclusion: These derivatives may serve as a source of potential antioxidants and also help to retard microbial growth in food industry. Similarly, the studies provide a basis for further research to develop more potent urease inhibitory compounds of medicinal /agricultural interest. Amides, antimicrobial, creatinine, gram-negative, pathogen, urease inhibitors.